Amalia Halikias and Josh Bansal entered Yale University in 2011 and 2012 as two liberal young people, but graduated as conservatives and on a mission to teach children traditional values. Bansal and Halikias determined that one of the most effective ways to teach moral principles is through storytelling, because books play a pivotal role in any child’s upbringing. Stories craft how young people see the world and the value they place on things like honesty or hard work. Over the past decade, there has been a dramatic increase in children’s stories that push left-wing ideology over traditional values. 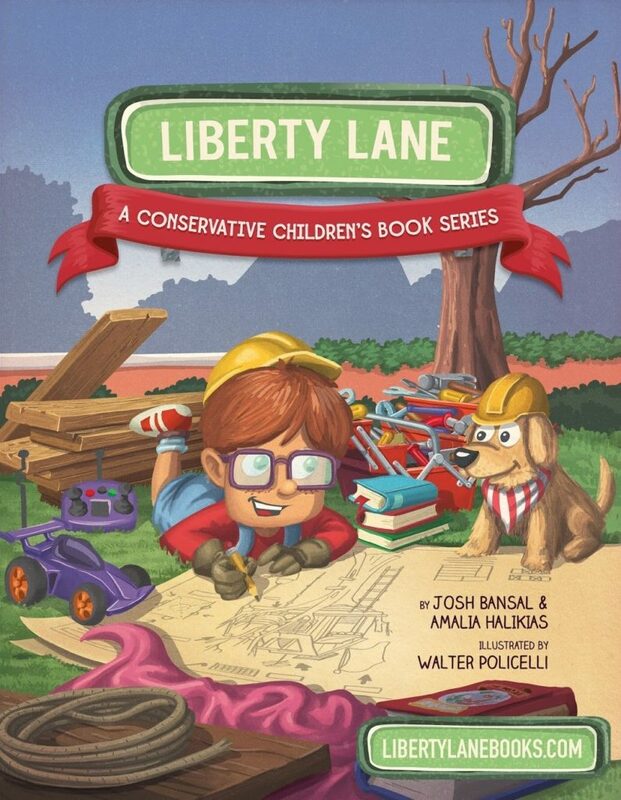 The lack of children’s stories that aim to teach conservative principles is what led Bansal and Halikias to write “Liberty Lane,” a five-book children’s series promoting the values of hard work, personal responsibility, tradition, humility, and patriotism. Bansal and Halikias, both recent Yale graduates, explored their political beliefs during their college careers, a journey that ultimately led them to move right of center. If you don’t have children and have not visited the children’s book section of a bookstore recently, you might not have heard of progressive titles like “Feminist Baby,” “A Is for Activist,” “C is for Consent,” “Pink is for Boys,” “My Princess Boy,” and many more. The “Liberty Lane” series follows a young boy named Ralph, whose father is a pilot in the Navy. At the beginning of the series, Ralph moves to a new city and finds himself living on Liberty Lane. Ralph and his friends, Carmen and Gus, face various challenges, but together learn about the importance of a hard day’s work, being honest, sharing in traditions, thinking of others, and celebrating our great nation. Reagan’s words encompass the overarching mission of “Liberty Lane”; specifically, to teach the next generation what freedom is and how we fight for it in our daily lives. The beautifully illustrated books are for children ages 4-9 years old, and are available for preorder now ahead of their official release on March 4. For a sneak preview of the books and to learn a little more about Bansal and Halikias, visit LibertyLaneBooks.com. Bansal and Halikias hope the “Liberty Lane” book series will be the first of many, and above all hope it will be a brand that parents can trust to be wholesome and to lay a foundation of traditional moral values in their children. Isn’t it amazing that these intelligent, brave young people are probably considered outcasts by much of the indoctrinated society. I come to this site every once in a while because I can no longer support the extremism of the left, but I cannot support the garbage I read on this site either. I am hearing more lefties express disgust at the extremism too. They are not going to find any answers here. I don’t like everything Scott says but, I voted for him because he is centrist, even on abortion. By the way, there are more women in Vermont than men; the abortion vote could not have gone any other way. It disgusts me every time I hear the words that the U.S. ‘is better than all other countries’. I hope you don’t mean ‘all other people.’ Americans are not, as Trump would have you believe, better than other people. Those people love their country as much as you do. Frankly, even as a young girl I always admired Canadian men – they lack the machismo of American men – such a turn off. I hate that our government brainwashes American men into killing others around the world because ‘they are less than us’ – otherwise known as patriotism, and patriotism is what makes you a man. White men have done many, many evil things in this country and around the world. Face it or not, it is true. School history books do need to be changed to teach this country’s true history. Bansal & Halikas books are a good thing but, don’t forget they changed from liberalism to conservatism. That’s what young people do, they find their own answers. I changed from conservative to liberal at their age. Now, I seek balance. The conservative message is not thriving because it promotes an ugly uncaring message. Our country is only as good as we treat our most downtrodden – like homeless vets living on the street while the military budget is around 800 B. It’s immoral so don’t talk about children needing to learn morality from conservatives – like that of Neil Johnson and others on this site. He complains about affordable housing while the U.S’s largest budget is about killing. We don’t need another Ethan Allen, we need balance. Boy what a jaded outlook on the world. White men did more good than bad and the founders of this country were intelligent, educated white men. There is nothing wrong with patriotism and loving our country and not wanting it over run with illegal aliens who add little it anything to our society and culture. Proud to be a white man and you don’t have to like it because quite frankly Charlotte, I don’t give a damn. It sounds like you need to find your own country. You are young and an educational product of the lefts teachings. I suggest that you read the unaltered history of America, the Federalist Papers and study the constitution. Our government has overstepped it’s authority on almost everything. The constitution is the “supreme law of the land” Article VI of the US Constitution. We are a diverse nation of 325 million people. There will never be true balance until all are treated equally under our founding document. Money corrupts politicians, the courts legislate from the bench, teachers and professors slant the meanings of everything to suit their ideologies. And the people suffer under the weight of endless rules and regulations from unelected bureaucrats. The balance you seek is in our founding document, we just need to follow it. No other country in the world has such a roadmap for the free exercise of the individual. eCoteau,: “It sounds like you need to find your own country.” Exactly, the kind of BS I expect on this site. If anyone disagrees with your and this site’s conservative views, they are wrong. I am not young. I am of the same conservative teachings that you are. Four members of my family served in the military. Like Bansal & Halikas I did my own searching; didn’t just succumb to U.S. BS propaganda. The rest of us put our names on our comments, you don’t. Who is MJ? MJ, You said, “The conservative message is not thriving because it promotes an ugly uncaring message”. The message you refer to is the message portrayed by the liberal news and liberal schools. The actual message is much different. No, Matt Young, it is not. So we can infer that at one point you did support the extremism of the left? Such hate point in the wrong direction. So sorry. While everyone was too busy working, asleep or just uninformed, the left crept into and stole all American institutions including education, the media, Hollywood and Vermont. These two Yale graduates experienced the destruction first hand and are doing something about it. Bitching, whining and being disgusted does nothing to remove the infection. What are you going to do? I thank these two people for getting to the children because that’s where it starts. The left always preaches equality but not at their institutions. Conservative actors have to hide their political leanings or be black listed. Colleges rarely hire conservative professors. School administrators at the K12 level are all liberal and have a union to protect them paid for by the taxpayers. Government employees, federal and state also have liberal unions paid for by taxpayers. Nothing is going to change without people doing what these two young people are doing. Where is our Vermont conservative leader? He certainly isn’t in the governors office. Republicans and or conservatives need a strong leader for the next election. If you are out there please step forward now (RINOs need not apply). of the tunnel for our Higher Education and the Country. we want to save the state. It’s an interesting question, where will the leaders come from? It used to be civics was taught across the land, you learned the basic principles that founded our nation and made it so much better than all other countries. The Farm Team for good leaders was our public education, that is no longer the case. As you have well stated, for two decades we have been teaching all sorts of things, much of it not useful for building and supporting a perfectly good Republic. It is excellent, however, in tearing down the fabric of great country. Other countries are/and have promoted this, it’s called subversion, something the Soviet Union was excellent with. It can also become self sustaining, which has clearly happened in Vermont. When a population’s ideology has been successfully subverted, many of it’s citizens will not recognize the truth, even when place before their nose. They are completely in defense of what they have been indoctrinated with. So when a good conservative says reduce taxes, it triggers those who automatically think this person is stupid and will be taking from those in need. How many thousands of times do we have to see this before we make changes to the conversation. Meanwhile, we have affordable housing programs stealing money from us blindly, building one room apartments for $335,000 ($560/sq.ft. )in downtown Montpelier, subsidized by you the tax payer. Now Vermont digger has had a commentary of this for well over 2 weeks and has yet to publish. Our most expensive, luxury slope side condominiums here at Sugarbush cost $444/sq.ft. to build, and I might add are a fair bit nicer. Until we a press that is willing to expose the massive corruption and misspending in out state why would it ever change. The general, uniformed public thinks everything is working fine. This is the only state wide organization that allows instant comments, everything else is……..moderated……the old Soviet Union would be jealous of how so many press organizations, privately owned, spew the same propaganda, they had to own all the press to accomplish this. I have been saying this for years, until conservatives expand their positive message in the media your indoctrination example will not change. You are correct, the left has developed mass indignation among it’s faithful. They are totally unable to realize that there could be other ideas and methods that are better than theirs. The indoctrination in the schools is another area where they win. They are teaching children history, slanted to implant a message that America is a crude, racist country built on years of injustice handed out by white European men. Young boys in training to be men are getting mixed messages about their role in society. They don’t know who or what they are anymore. Toxic masculinity, gender neutral, politically correct new speak and constant badgering from feminists in the media have destroyed a large percentage of young men which has lead to suicide. Many of my friends ask me why do I care because I’m older. I ask them why don’t they care because they grew up in a time before all of this nonsense. I want my children to live in freedom as they age and the responsibility falls to them. So my question still is, where is the next conservative leader for Vermont? It has to be a person with enough money to counter the war chest of the progressives, a true Patriot, a person able to counter the progressive propaganda machine, a person able to attract a grassroots movement. If today’s youth were told the truth of where progressive socialism will take them in the future they just might listen. We need the modern day political equivalent of Ethan Allen. If you are out there, Vermont needs your help!